It may sound like a dessert, but the Foie Gras Custard Brûlée is one of the best ways to start your meal off right at Sage. 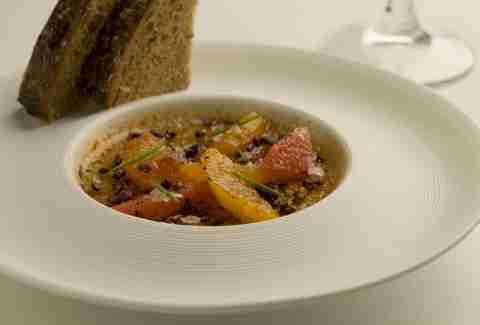 It comes with apricot chutney, toasted cocoa nibs, and salted brioche. 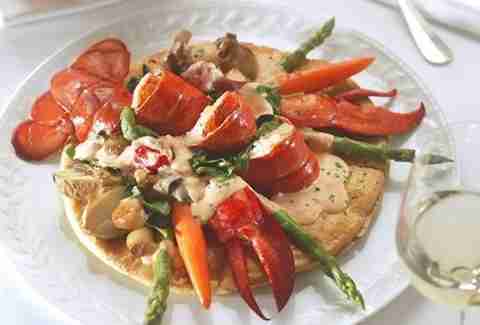 Hey look, lobster pot pie! But why use just chunks of lobster when you can go with almost the entire thing? 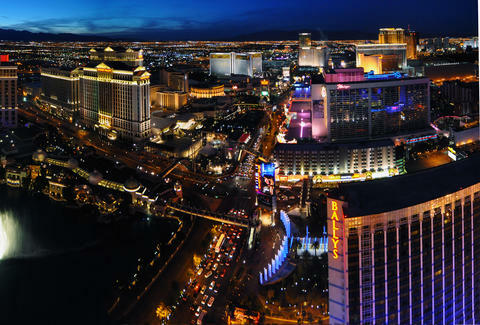 Guy Savoy’s only American restaurant is in Caesars Palace. Stop by for the French cuisine and start things off right with the chef’s famous artichoke and black truffle soup. Let’s cut to the chase. Circus Circus isn’t everyone’s cup of tea. But if you are going to have a cup of tea... have it alongside a New York strip steak at The Steakhouse -- a place that's overlooked, under-appreciated, and among the best steak joints in Vegas. The Steak River Farms Ribcap at Scarpetta is one of the most beautiful hunks of meat that you’ll ever see -- or taste. It’s grilled and then sautéed with mushrooms, then finished with a red wine reduction. It’s not always available, but don’t worry, you really can’t go wrong with anything on the menu here. The bacon-wrapped dates are the perfect way to start your meal at Giada (the first restaurant by Giada De Laurentiis), which just happens to have a perfect view of the busiest intersection in Las Vegas. 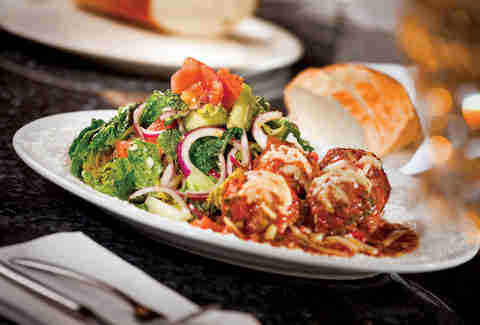 Joe Vicari’s Andiamo Italian Steakhouse shows that bigger is usually better, not only with their steaks, but also with the Grande Meatball -- a massive portion doused in homemade marinara sauce and topped with fresh ricotta cheese. Stewart + Ogden has an eclectic menu, with breakfast served around the clock, and a wide selection of Chinese food. 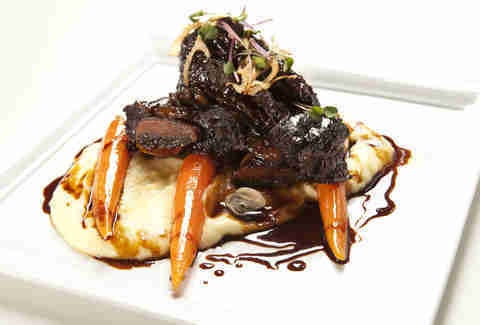 But the Perfect Braised Short Ribs live up to their name and could be the best thing to eat Downtown. The 75,000 gallon tropical fish aquarium is almost as impressive as the seared Chilean sea bass, which comes with lobster and jumbo lump crab, as well as artichoke and tomato orzo. People are known to wait in line for up to 30 minutes at the Feast Buffet for the Cajun-style crab legs -- prepared personally by Mama Sarah. Bring a friend to 35 Steaks + Martinis. 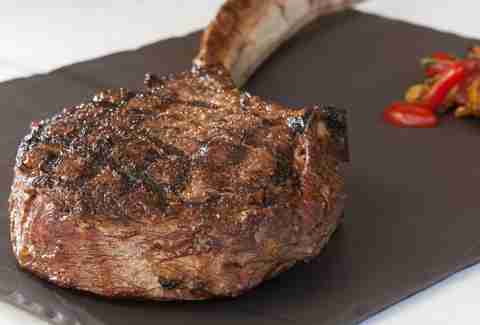 Together, you can finish off the 35oz Tomahawk steak. 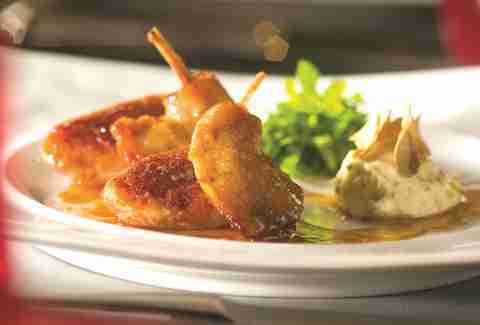 Tender has a wild game tasting plate featuring selections from the Broken Arrow Ranch in Texas. It’s likely the only place where you’ll find antelope, venison, and wild boar all on one plate. 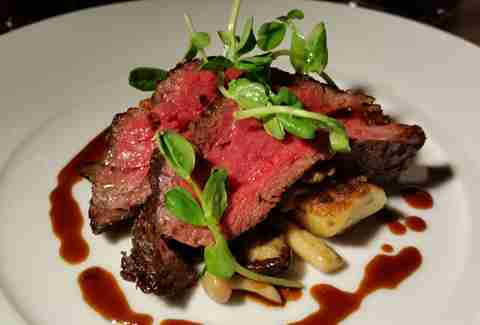 Michael Mina has created an all-beef battle royale at STRIPSTEAK with an American vs. Australian wagyu plate. Twist by Pierre Gagnaire offers a... waitforit!... twist on the usual cheese plate by offering Gorgonzola with pear ice cream. Joël Robuchon has two restaurants side by side. Choose the door on the left for the more casual (and affordable) L’Atelier de Joël Robuchon and order La Caille. Translation: foie gras stuffed free-range quail with mashed potatoes. Portofino might be the best kept secret on the Strip. It uses authentic ingredients straight from Italy and puts a spin on traditional dishes like chicken parmesan, which is made with organic chicken breast and stuffed with house-made sausage. 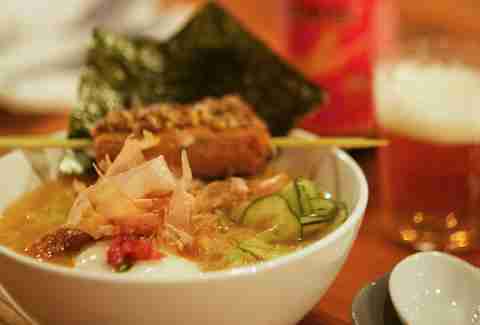 You can find the best ramen in Las Vegas in Chinatown (yes, there is one, sort of), or at Yusho Japanese Grill & Noodle House. The Logan Poser Ramen is a response to critics of nontraditional Japanese cuisine, and features a hearty broth of hen egg, nori, cucumbers, and noodles. The Candied bacon at Table 10 is an appetizer large enough to share, and is made with North Country Farm bacon & handcrafted maple syrup known as Noble Tonic #1. NOVE doesn't serve just any old spaghetti, they load it down with lobster, shrimp, crab, scallops, calamari, and basil. 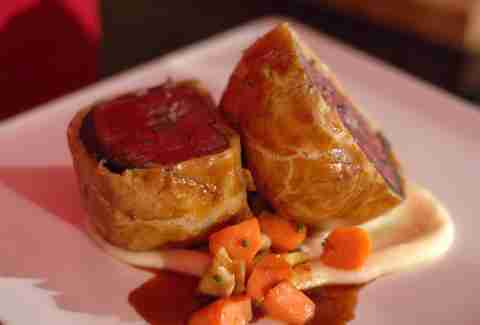 Gordon Ramsay Steak is the only place to go for the celebrity chef’s ultimate signature dish -- a Beef Wellington that is famous for melting in your mouth. The Brit makes the list twice! The Hog Burger at Gordon Ramsay BurGR is the only dish in Las Vegas made with Mangalitsa pork -- a unique tender meat with a concentrated flavor made from specially raised pigs. One of the reasons Mercadito is one of the best new restaurants in Las Vegas is the freshly prepared mango guacamole with jícama, chipotle, and pico de gallo. Great views and family-style portions are what you’ll find at Martorano’s, along with something truly unexpected: a salad that's actually worth eating... mainly 'cause it's mostly meat. Need a carb fix after working up a sweat at the new LiFE nightclub? The Griddle Cafe is open 24 hours and serves enormous stacks of pancakes to help fill your glycogen stores. Go with Banananana -- the ones made with brown sugar-baked bananas. You get more than a sky-high view when dining at the Top of the World restaurant. 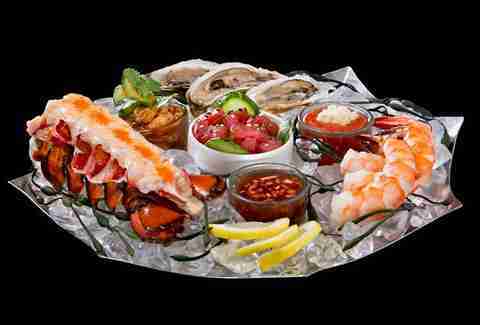 You also get a chance to dive into the Mosaic of Chilled Seafood, a shareable platter with Gulf prawns, Alaskan king crab, ahi tuna poke, and salmon poke with seaweed salad. The BBQ pulled pork sandwich at Gilley’s contains slow-cooked pork, mixed with a smoked onion sauce and topped with coleslaw. It'll give you all the energy you need to dance with the cowgirls. The Market Café Vdara serves up an amazing Lobster Tempura Benedict that is so good it would give any Las Vegas hangover breakfast a run for its money. 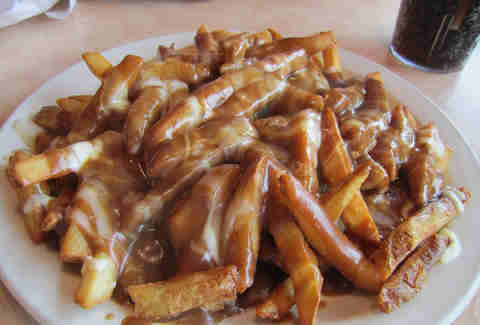 Sometimes it’s just more fun to skip the fancy fine dining stuff, so get the poutine, which is a plate full of French fries, duck confit, cheese curd, and stout gravy. Want to order Southern grub and feel like a food snob at the same time? Go with the mushroom grits at La Cave, they're the tastiest spin you’ll find on a Southern staple.